What areas of the healthcare market do service? Our target market is the acute care hospital within the patient setting. Hospital televisions are engineered and constructed with a different end user in mind. 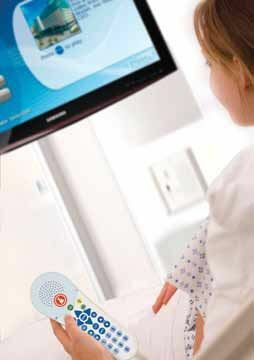 Manufacturers design healthcare-grade HDTV sets to provide a homelike viewing experience while adding additional features around patient safety, operational efficiency, and patient satisfaction. They also must account for withstanding the heavy wear and tear and long operating hours of a patient room. Healthcare-grade televisions also provide operational features that make a hospitalwide deployment less labor intrusive from a staff perspective. Cloning technology, universal pillow speaker interfaces, pillow speaker controls, and front-panel locking control functionality help ensure the hospital has an effective implementation. What has been the biggest change in the provision of healthcare-grade televisions in the past five years? The largest change from a hospital perspective is the introduction of the LED line of sets. Typically in a hospital setting, space is at a premium, so being able to deliver a larger viewing area similar to what the patient has at home has been a huge patient satisfier. These sets also provide as much as a 70 percent reduction in the power consumption over previous models. Taking into account the operating expenses associated with patient television viewing, some hospitals can see a return on investment in as little as six months in power savings alone. How are patient education systems evolving to improve the patient experience? As the nation’s health system experiences a shift to value-based care, interactive patient education solutions are designed to advance the role of patient engagement in providing enhanced levels of care and achieving critical performance objectives. The dramatic changes shaping healthcare today are creating patient experience initiatives in every aspect of care delivery, and interactive patient engagement systems are able to provide a supporting technology to all of them. With the advancement of these technologies, they can now go far beyond on-demand patient education in the inpatient setting. From condition-specific care plans across the recovery continuum to integrations with EMRs and other critical hospital systems, interactive patient engagement systems can aid in transforming the patient and caregiver experience. What are the challenges in designing and installing video systems for healthcare applications? The largest challenge in designing and installing interactive patient engagement systems is that in itself. Each hospital has its own goals, needs, workflows, and objectives, so the vast amounts of customization and flexibility needed of the systems is always a pleasure to watch as they take shape. What is the human ROI on video display systems in healthcare? Determining a true ROI around this technology is almost unattainable, as I would never attribute the increases in reimbursement, revenue, and the other values of these systems to be the sole source of these dollars. Health reform has put these challenges in front of hospitals and health systems, many of which already have initiatives in place. These systems are a powerful supporting technology to take these patient-centered programs to another level by achieving added cost-savings through workflow efficiencies, aid in achieving meaningful use criteria, increased reimbursement through an enhanced patient experience, and decreasing readmissions from empowered patients.